While it's no surprise to anyone now that the USDA sleeps with the largest food manufactures in our food system. Scientists, Doctors, Nutritionist and even Harvard School of Public Health have long been critics of the USDA Food Pyramid and the clear distinction between lobbyist dollars and the recommendations of the government. Above is a photo of the 2005 updated version of the Food Pyramid, which was modified into vertical, confusing shapes and colors. A confusing mix of serving sizes balanced with running up stairs. An almost indistinguishable yellow line marking the fats and oils category, milk and dairy is as big as vegetables, which isn't as big as grains and the meat category for the first time in Food Pyramid history took a dive in importance and is seen as the second smaller sliver. Now let's take a look at the 2005 Harvard School of Public Health and Harvard Medical School's recommended Food Pyramid. First what stands out is the recommendation for alcohol, multivitamins and a clear message about exercise at the base of the pyramid. HSPH goes further with their findings, bringing in language about "refined" grains such as white rice or white bread at the very top to use sparingly like butter, oil and red meats. Dairy is the 2nd lowest, not the 2nd highest like the USDAs and a new category of nuts and legumes were added! Wow! Not only is this important for everyone but vegetarians especially. Plant oils also make the base of this pyramid suggesting the importance of oil in our diet, yet appears as a barely noticeable sliver on the USDAs. Also vegetables and grains have no serving suggestion, just eat them! We know the USDA takes input from major industry as experts in their fields, such as the Dairy Counsel and has since it's inception in 1943. When the updated Pyramid was delayed for several months, speculations arose about which "food group" lobbyist were arguing the most about their box of the pyramid. 7 months later, the image to the left was unveiled and WOW. I mean really WOW! Way to make a very uncharacteristic approach in government and simplify this for us! 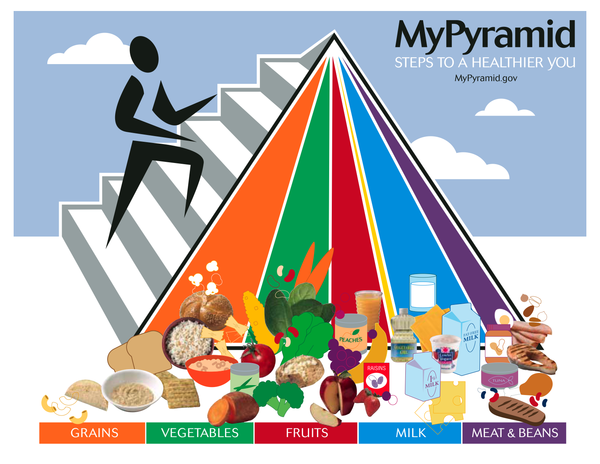 Replacing the pyramid with MyPlate was an excellent move. Eliminating serving sizes, qualifiers and that pyramid make this a reference tool that is easy to see with one glance. The department said that the input from the Childhood Obesity Task Force was a major consideration and Michelle Obama, said in a statement "When mom or dad comes home from a long day of work, we're already asked to be a chef, a referee, a cleaning crew. So it's tough to be a nutritionist, too," Michelle Obama said in a statement on Thursday. "But we do have time to take a look at our kids' plates. As long as they're half full of fruits and vegetables and paired with lean proteins, whole grains and low-fat diary, we're golden." Quit being a stick in the mud Harvard School of Public Health and Harvard Medical! While, the USDA MyPlate is a simplified version, Harvard calls it's Plate "based on science" and fixes many key flaws with the USDA plate. Harvard also moves to a simpler shape, cutting out illustrations of food while it opts to keep the detail it's always had and amplifies it. Removing alcohol and adding water was a smart choice as well as defining healthy oils, whole grains and stating that potatoes and french fries don't count as vegetables. Protein include vegetarian sources and recommend avoiding processed meats like bacon and limiting red meat. As someone who did undergrad in Public Health, I understand the USDA. In anything Public Health related, you want to reach as many people as possible with little to no consideration to the individual: vaccinations, diet/nutrition, seat belts/safety, fluoride in drinking water and so on. What I like about the government's approach is that it does follow that Public Health design but in doing so, makes it incredibly simple for the most simple minded person in regards to nutrition. On the flip side, Harvard School of Public Health takes a different approach based on scientific research on nutrition, pairing with the Harvard Medical School. They still follow Public Health guidelines of making something for the masses, but trust the audience will be a bit more skilled and discriminating in their food selection. Do you follow the Food Pyramid? How do you know which to choose? I recently moved to a new home and am rediscovering my incredible love of creative cooking. While reacquainting myself my favourite recipes, I found this...a resource to seasonal food. As children of the earth, it's important to honour the cycles of the earth and to not spend a high carbon footprint importing raspberries from Chile (ugh, Trader Joe's).